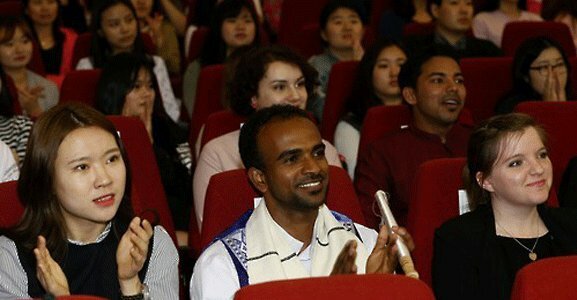 The 19th Korean speech contest took place on Thursday at Kyunghee University’s Crown Concert Hall in Seoul, with the best prize going to Uzbekistan student Rakhimboboev Bakhtiyor. According to the Institute of International Education at Kyunghee University, 1,325 people from 43 countries applied to participate in this year’s event. From this number, 68 made the cut at a preliminary round last month. A majority of them were international students studying in Korea, but some were practicing lawyers in domestic law firms. A Japanese university student reportedly flew in from the neighboring country just for the occasion. The participants discussed Korean culture in university and workplaces, as well as the recent controversy on the idea that social stratification begins in Korea from birth, with people either born with a golden spoon or nothing at all. The hosts of the contest were German television personality Daniel Lindemann of the JTBC talk show “Non Summit” and actor Lee Sun-ho from the show “We Got Married.” Around 700 people made up the audience. The contestants were evaluated on the content of their speech, pronunciation, attitude and on their ability to capture the audience. Rakhimboboev Bakhtiyor from Uzbekistan won the best prize -- the Minister’s Commendation from the Ministry of Culture, Sports and Tourism -- with a topic about the discrimination against Asians in South Korea. Contestants from Germany, the U.S. and France each grabbed the next biggest awards by speaking on topics such as leadership in Korea, the working culture in Korea and the attractiveness of the Korean culture. Choi Sang-jin a professor of Korean literature at Kyunghee University, said the standards of contestants had soared compared to last year. This contest was first held in 1998 in celebration of the 600th anniversary of King Sejong’s birthday. He is the creator of the Korean writing system.